Great strides have been made in the digitalisation of inbound company mail in recent years. But there is still a significant amount that has to be delivered manually: registered mail, document originals, certificates, catalogues, consignments of goods, etc. And with large organisations with thousands of staff, this can add up to several hundred mailings a day. NetLocker supports mail room staff to deliver these items in a safe, flexible and traceable way. As far as possible, inbound mail is digitalised. The rest is handled by NetLocker. Recipient, size, weight and a photo are recorded, using sensors if desired. The mail item is given a tracking ID. After all data has been recorded, a sticker is printed for each mail item with the tracking ID and the name of the destination mailbox system. The mail is sorted according to the destination mailbox system and is ready to be taken out for delivery. After the delivery person registers with their company ID card, each mail item is scanned individually using a robust and powerful scanner. The assigned mailbox opens, the delivery person places the mail item in the box and closes it again. This eliminates the possibility of mail being delivered to the wrong person. The delivery person authenticates themselves using their company ID card. The delivery person removes the uncollected mail items and brings them back to the mail room, where they are handled using the NetLocker process for uncollected mail. Recipients are informed by e-mail or by SMS that they have mail and where they can pick it up. All mailboxes that contain mail for the corresponding user open immediately. Delivery is now complete. The timestamp and the user are logged. Recording the user is relevant in the case that mail is being collected by a designated deputy. Adaptable, attractive and easy to use. Our equipment ticks all the boxes. Every customers’ needs are different. How many boxes are needed? What size should they be? The equipment should complement the existing interior design as much as possible. The right colours and materials have to be selected. We have developed a standard system, which, through its modularity, covers a broad scope of applications. Beyond that, there are (almost) no limits. The cabinet gets the intelligence it needs through the cabinet controller (NDC – NetLocker Device Controller). It communicates with the server system, it drives the RFID and barcode readers and it controls the electronic locks. A touchscreen is available as an option, in order to facilitate further interactive applications. The RFID reader can read all commonly-used cards. In the case of MIFARE and LEGIC chips, customer segments can also be read. This is where it all happens. Mail is registered here, the cabinets are configured and monitored, and user roles are defined and administered. Through a Self Service Portal, every member of staff can define their own delivery rules by recording substitutes, forwarding routines and absences. Web-based. Of course. Every project is different. Use our experience and let us know what your requirements are, on a no-obligation basis. 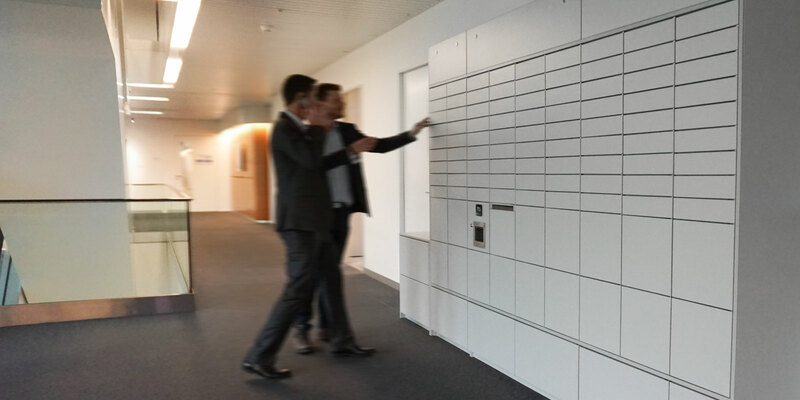 We will discuss quantity structures, registration, the number of cabinets, the number and dimensions of the mailboxes. We will present the standard processes and the options available for integration. With more complex projects and with customised software expansions, we will be happy to talk about the options with you and your IT department, and help you create the Functional specification. A test system for validating the processes and for acceptance testing can be very helpful, particularly with larger projects. We offer you a demo system for a fixed price. This includes the construction of the demonstration equipment and a recording station on site, a Cloud installation, the creation of test users (normally 20 - 40 persons) and the commissioning of the system. You will either use RFID tags from us or the unique ID from from you company ID cards. The required processes are described and an offer is created. Process implementation kick-off and cabinet production. Construction of the cabinet system, installation of the software, training for the mail room staff, on-site support during the initial implementation days, support for staff when collecting their mail. We will of course support you after the system has gone live. Customised reaction and resolution times are defined through flexible Maintenance contracts.